From the point of view of curriculum design and teacher preparation schooling is divided into five 'stages' i.e the Pre-Primary School (Nursery to UKG), Primary School (Classes I to V), Middle School (Classes VI to VIII), Secondary School (Classes IX & X) and Senior Secondary School (Classes XI & XII). The break-up of schooling into these five stages extends far beyond mere administrative convenience, as these stages have developmental validity. Describing the characteristics and concerns of the curriculum, pedagogy and assessment in stages allows tailor made syllabi, textbooks and learning resources. It enables teachers to plan for children's development and the gradual and cumulative deepening of abilities, competencies and concepts. Childhood is a period of growth and change, involving developing one’s physical and mental capacities to the fullest. We recognize the child as a natural learner, and knowledge as the outcome of the child’s own activity. For this to happen, opportunities to try out, manipulate, make mistakes and correct oneself are essential. The early childhood stage, age 6–8 years, is the most critical period when the foundations are laid for life-long development and the realization of full potential. Learning in the early years at our school is hence directed by the child's interests and priorities and is contextualized by his/her experiences rather than being structured formally. At this early stage of learning, from pre-primary to the primary school years, an important place is given to language and mathematics in all activities across the curriculum. The division into subjects is not very significant, and the knowledge areas are totally integrated and presented to children in the form of learning experiences from the environment. At the Primary School we provide new opportunities for all learners to learn about themselves, others and society. The children actively engage with the world around them, exploring, responding, inventing and working things out, and making meaning. A detailed and documented curriculum framework, encompassing academic and co curricular activities, is periodically revisited and revamped to make it responsive to the changing environment and education needs of the child. This ensures that the skills to be inculcated in children are imparted in a graded manner. The approach to the whole curriculum is process oriented rather than outcome oriented. At the primary school we also ensure that children become digitally literate – able to use, and express themselves and develop their ideas through information and communication technology at a level suitable for the future workplace and as active participants in a digital world. 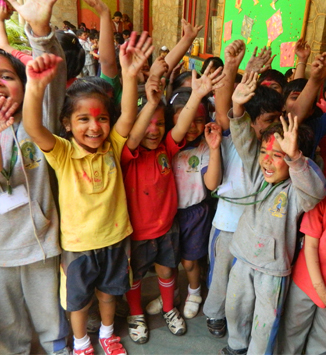 A variety of activities at this stage of schooling are made available, including participation in cultural programmes, organizing events, travelling to places outside the school, providing experiences to develop socially and emotionally into creative and confident individuals, proud of their culture, sensitive to others, and capable of taking initiative and responsibility. Our Pre-Primary curriculum makes an effort to move away from a textbook culture which makes it an inclusive, age-appropriate and meaningful experience for children. Playing, music, rhyming, art and other activities using local materials, along with opportunities for speaking, listening and expression with informal interaction are essential components of learning at this stage. Aesthetic sensibility and experience being the prime sites of a growing child's creativity, we have brought the arts squarely into the domain of the curricular, ingesting them in all areas of learning while being mindful of their individual identity at relevant stages. The language used in pre-primary is one that the child is familiar with in the immediate environment, while an informal multilingual classroom helps children to comfortably adjust to the early introduction of English. At the pre-primary stage children come equipped with basic interpersonal communicative skills in Hindi, they therefore need to acquire cognitively advanced levels of language proficiency at school. Stories, poems, songs and drama link children to their cultural heritage, and also give them an opportunity to understand their own experiences and to develop sensitivity to others. The emphasis is on listening and speaking a language before learning to read and write it. Also, effective early reading skills are the essential building blocks for language and literacy learning. We use the Jolly Phonics method which is a fun and child centered approach to teaching English literacy through synthetic phonics. With actions for each of the 42 letter sounds, the multi-sensory method is very motivating for children and teachers, who can see their students make quick progress. The sounds are taught in a specific order (not alphabetically) using the holistic approach – visual, aural and physical. This enables children to begin building words as early as possible. In the Pre-Primary school the children practise blending phonemes for reading, and segmenting phonemes for spelling. Mathematics at the pre-primary stage ensures that children understand, in the context of small sets, the connection between counting and quantity rather than the rote learning of the number sequence. Making simple comparisons and identifying shapes and symmetries are appropriate skills to acquire at this stage. At pre-primary, learning with fun methodology is adopted to enable learner to get familiar with computers. Various educational tools such as GCompris Educational Softwsare, Childsplay, KTuberling (Potato Guy) and their numerous activities are used to enable the pupil to handle mouse, mouse gestures and keyboard. Game oriented but nonetheless educational tools such as memory activities, listening exercises and puzzles with various difficulty levels are introduced at different stages . The period of primary school (from Class I to Class V) marks the formal introduction of the child to reading, writing, arithmetic and environmental studies. This period of five years is one of tremendous cognitive development; shaping reason, intellect and social skills. English: The first concern of the school is on the development of the child's language competence: issues related to articulation and literacy; the ability to use language to create, to think and to communicate with others. In classes I and II, the curriculum aims at arousing curiosity and interests children in the process of sharing ideas and experiences; to listen patiently to others and to relate their own experiences through stories and poetry; to be able to express themselves orally and to become visually familiar with text [word(s)], what it means, and to notice its component letter (s) and the sound-values they stand for. In classes III to V the focus is to enrich learners’ vocabulary, to use appropriate spoken and written language in meaningful contexts/situations, to familiarize learners with the basic process of writing - to prepare a notice, or write a message for someone or write a short composition based on pictures. Mathematics: The curriculum explicitly incorporates the progression that learners make from the concrete to the abstract while acquiring concepts. Concepts and ideas are generally arrived at from observing patterns, exploring them and then trying to define them in their own words. The sequencing of the concepts from class I to class V is not linear, but spiral. Mathematical games, puzzles and stories help in developing a positive attitude and in making connections between mathematics and everyday thinking. Besides numbers and number operations, due importance is given to shapes, spatial understanding, patterns, measurement, data handling and mental arithmetic. Apart from computational skills, stress is laid on identifying, expressing and explaining patterns, on estimation and approximation in solving problems, on making connections, and on the development of skills of language in communication and reasoning. Environmental Studies: The NCF 2000 had recommended that Environmental Studies be taught as an integrated course for the entire primary stage, instead of in two distinct parts devoted to science and social studies in Classes III-V. The present NCF 2005 has called for the continuation and further strengthening of this integrated approach for Environmental Studies during the primary years. The objectives of the curriculum at this stage are to nurture the curiosity of the child about the world (natural environment, artifacts and people), to have the child engage in exploratory and hands-on activities for acquiring the basic cognitive and psychomotor skills through observation, classification, inference, etc. Small Science is a series of innovative primary science books developed by the Homi Bhabha Centre for Science Education that discourages rote learning and aims to develop skills of systematic observation, analysis and articulation. In Classes I and II, the curriculum is built out of simple, thematically organised, activities and exercises. The syllabus is woven around six common themes close to the child’s life such as Me and My Family, Plants & Animals, Food, People & Places, Time and Things Around Us. In Class III to V the focus is on our natural world with topics in Class III like The Living World, Our Body & Our Food, Measurement and Making House. In Class IV the topics covered are Sky & Weather, Air, Water & Food whereas in Class V the topics include The Web of Life, Moving Things, Earth & its Neighbours, Our Bodies and Materials. Information Technology:To the best of our knowledge, there is no ICT syllabus that integrates systematic use of FOSS (Free and Open Source Software) applications and teaching material for FOSS based education. Hence, we developed a syllabus and content using FOSS applications that focuses on teaching core concepts of IT along with learning of other subjects like Maths, Science, English. At class I and II level pupils learn to use keyboard with both the hands for typing the words, handle mouse, read & recognize small words. Tux Paint is used to identify shapes in their environment and use electronic tools to get desired effects. Learners understand the use of numeric keys and perform Simple Mathematical Calculations (addition and subtraction) too with TuxMath. At the next stage, in classes III to V, OpenOffice.org Word Processor is introduced to design creatively formatted text documents like cards and posters using tables, frames and drawing toolbars. Pupils are also given a variety of topics across disciplines to create attractive presentations in OpenOffice.org Presentation using different tools, formatting options, implication of charts. To create more interesting presentation pupils use custom animation, sound effects, and videos. K Turtle is introduced to create theme based drawings on the canvas using commands and customize it. Pupils also use string containers, concept of RGB combination, operators, data types, controlling execution, looping.